New Port Richey chiropractor, Dr. Scott Coletti, has been providing chiropractic services for the past 15 years. His multi-disciplined practice, Baywest Health & Rehab, uses chiropractic and adjunct therapies to effectively relieve each of their patients’ pain. Dr. Coletti grew up embracing the philosophy of natural healing. When it came to maintaining his own health, he always followed the belief, “less is more.” This mentality aligned with chiropractic care by embracing natural healing without the unnecessary use of drugs or traditional medical procedures. 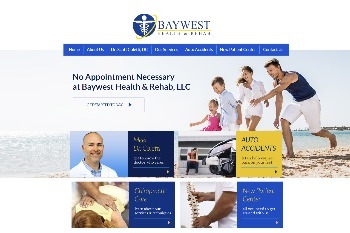 In the process of developing their new practice website, we learned about the three tenants that define Baywest Health & Rehab: comfort, convenience, and centralized care. The Baywest staff isn’t interested in hearing themselves speak. Their goal is to get what patients want out of their own health, and to work collaboratively to achieve those goals. Whether it’s an auto accident, common back pain, or finding the right neuropathy treatment, Dr. Coletti guides his patients through a process of restorative and sustainable natural health. “Everyone at BayWest is doing a great job. I feel great after all the treatments – especially the massage. Everyone is friendly and make you feel at home. Great job everyone!” – J. K.